I told you I’d be back soon! 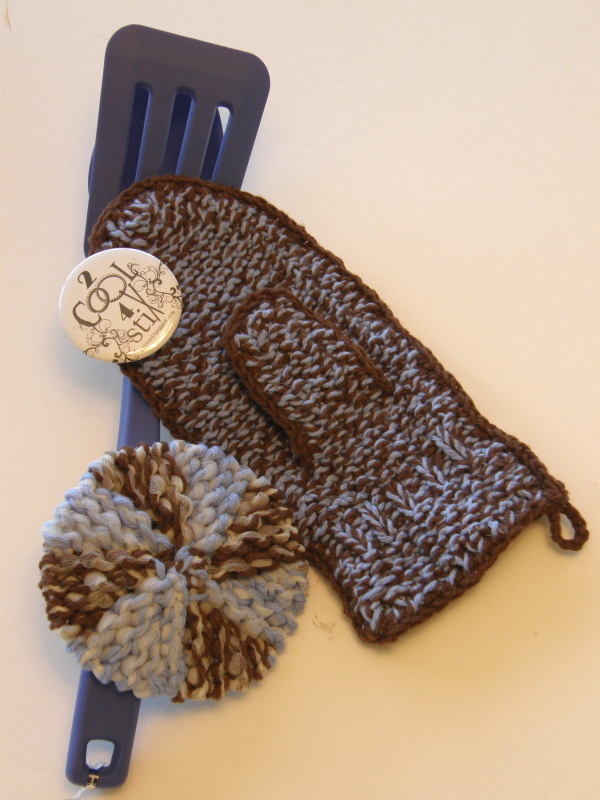 This Scrubby-O is just a bit different from the others I’ve made, as it has alternating colored wedges! 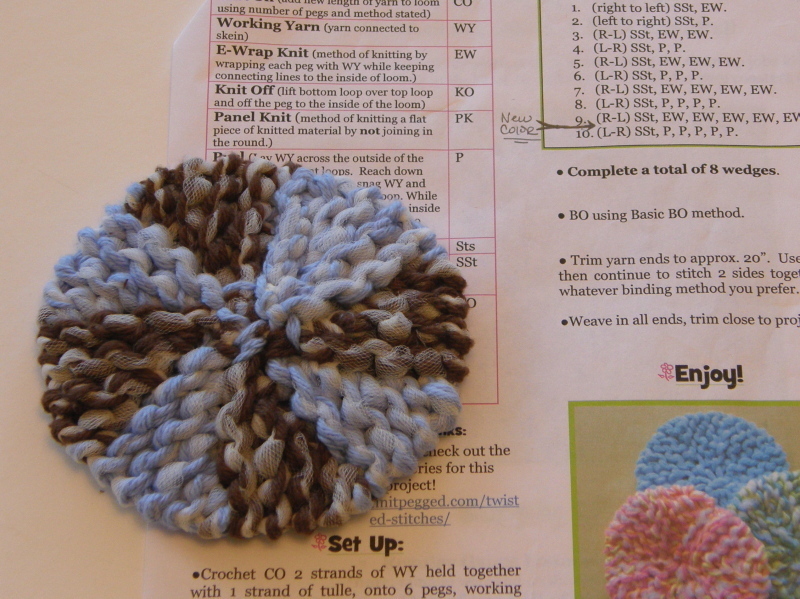 I thought it would be a good thing to pass along the tips to making one of these pinwheel type Scrubby-O’s directly onto all of you, in case you’d like to do the same…. First of all, you’ll need to have 2 different colors of cotton (that’s fairly obvious, lol). You’ll need to begin your CO by holding 2 strands of the first color along with your strand of tulle. 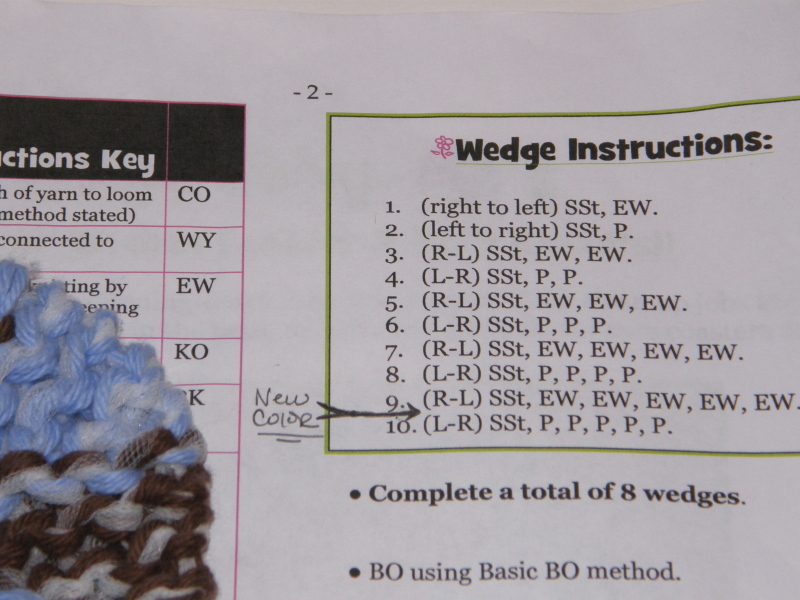 When you’re ready to repeat the wedge instructions, just continue with Row #1 using the new color you’ve just CO…changing colors again when you’ve completed Row #9. That’s it! You’ll now have a super cuteness Pinwheel Scrubby-O! I’m going to be working up a pattern very soon for you all to try out… after all, you still have time to whip up a couple of these as Christmas presents if you hurry… We may even work on this together as a loom along in the Gettin’ It Pegged Chat Clique! So, off I go to do some typing and some pattern writing…have a fun filled Friday! 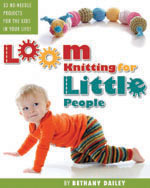 This entry was posted in Free Loom Patterns, Holidays, Loom Alongs, Loom Knitting, Looming Patterns, New Projects, Tutorials. Bookmark the permalink. Wahooo! That is so cool looking! Can’t wait to make some more Scrubbie-O’s for everyone for Christmas 🙂 If I have the time… I’m going to make that oven mitt for my favorite cook… my hubby! Oh, this would make an excellent “guy in the kitchen” gift, Jolene! 🙂 I’ll hurry and make up the pattern for you! Love the pinwheel scrubbie, Bethany 🙂 And the oven mitt is too cool! I think it would make for a fabulous loom along. Hugs! Thank you so much, Jenny! 🙂 I think everyone is in agreement that we’d like to work on the oven mitt as a group…should be a lot of fun! Hi i just wanted to say i love your scrubby-o’s paddern! It is really helpfull that you have a step by step video!! they are fast and easy to make!! I never thought i could do it. But your video is easy to fallow. But i have a question on one of your other padderns. On your raffie handbag pattern once again it is easy for me to fallow. I just wanted to know what a 1 button-on-bag #9850 in Nat is? And where i can find one? Thanks for your help Tiffany! I hope you can locate one, or if not, the pattern should work for many other type bags of the same size and style with just a few adjustments. Thanks for the step to step video on your Scrubby O’s. I have been making them for a couple of years. I just love them. My sister is coming over in a couple of days. I will be showing her your video and show her how to make them. She wants to make them with her daughter’s girl scout troop. It will be lots of fun.